Mr. Frugalwoods and I are officially ready for Babywoods. Frugal Hound less so, but only because she’s a dog and has no idea how much her little hound world is about to be rocked. We humans of the household have been engaged in baby prep for months now and, at exactly two weeks to her due date, I believe we can consider ourselves prepared. Over-prepared perhaps. But the crucial thing is, we’re only prepared in the ways that are within our control. While our environment is in a state of readiness, the inscrutable world of what we’ll actually do to keep this infant alive, thriving, and happy remains a mystery to us first-time parents. Over the course of these preparatory months, I’ve come to terms with the fact that I have an abiding (Mr. FW might say fanatical) desire to control the logistics, mechanics, and physical surroundings of my life. I derive immense satisfaction from the fact that Babywoods’ hand-me-down nursery is entirely set-up; her carseat is installed; I’ve cleaned/scoured the house from top to bottom (including the basement in which I dusted all of the mechanicals… much to Mr. FW’s mild horror); and Mr. FW cooked and froze a bunch-o-food in anticipation of exhaustion-riddled mealtimes. We’ve selected, met, and quizzed her pediatrician; pre-paid the copay for her birth; taken a childbirth prep class; packed our hospital bag (with snacks! ); tackled the mountains of paperwork involved in this whole affair; established parental leave plans with our respective workplaces; practiced driving to the hospital; and scheduled family to visit in December. Plus, we bathed poor Frugal Hound, trimmed her claws, and washed all of her hound bedding (she was distinctly not amused). I’ve also continued to exercise and eat well throughout my entire pregnancy in an effort to give Babywoods the healthiest, strongest start in life. Still, I know there are things I’ve forgotten, overlooked, or screwed up. But that’s where our preparation has to stop. There’s nothing more we can do. Yes, I’ll undoubtedly flap around until I go into labor making lists of random (and usually ridiculous) tasks that I’ve decided we simply must accomplish lest we fail as parents. To give you a sense of just how addled my pregnant brain is right now, the list currently includes: wash sliding glass back door and vacuum out Frugalwoods-mobile–neither of which have anything remotely to do with welcoming a child into the world. Despite this mania, I’ve accepted–or at least Mr. FW has and I’m trying to join him on his zen-like perch–that there’s an absolute limit to how much we can gird ourselves for this monumental life event. At a certain point, we have to surrender to God and say, OK, I recognize I’ve done everything possible and now I must simply wait. But here’s the thing: I don’t wait well. I’m not a fabulously patient person (major shortcoming of mine) and I don’t twiddle thumbs. It’s very difficult (read: impossible) for me to embrace periods of waiting in my life, but I’ve actually/somehow become rather adept at it over the years. Age and maturity and all that I suppose, or just the realization that nothing terrible has ever happened to me while waiting… yet! Our long-term goal of financial independence and homesteading falls into the same ‘hurry up and wait’ camp. We’ve controlled what we can–a high savings rate, extensive homestead research, and detailed financial projections–and now, all we’re able to do is… wait. As I discussed on Monday, there’s nothing to gain by endlessly tweaking our finances or otherwise messing with our money. All we can and should do is exercise patient restraint (gah! easier said than done). Accepting that there’s nothing more I can do and letting go is immensely difficult for me. It’s in my very nature to constantly scan for efficiencies, optimizations, and new opportunities. But I have to allow myself to find contentment in the work I’ve executed. I need to celebrate my successes instead of berating myself for not having vacuumed out the car yet (see, I’m still thinking about it!). 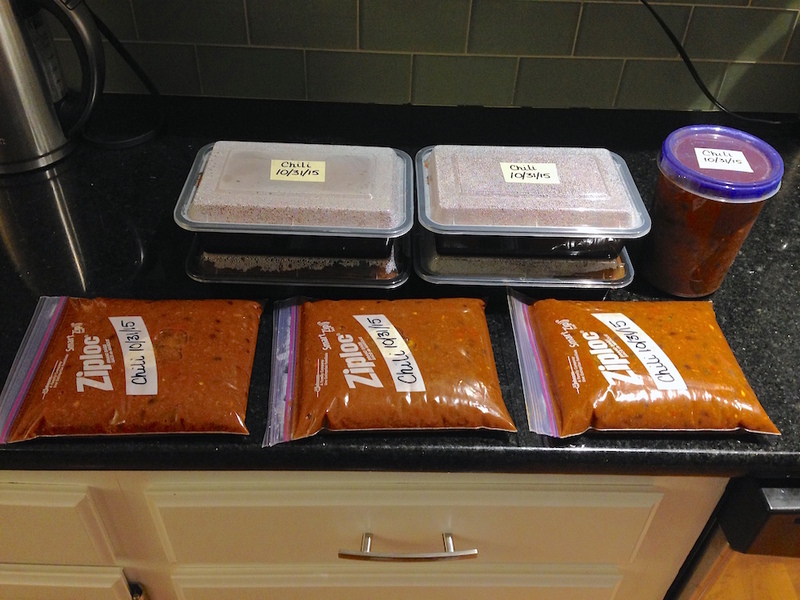 Chili portioned out and ready to freeze! Our culture is one of immediacy. We’re told that we can have anything we want, fix every last problem, look like a supermodel, and find lifelong gratification instantaneously–through, of course, the old falsehood of spending money. Marketers and ads tout miraculous weight loss, hair regrowth, and spontaneous success–all to be had for a mere swipe of the credit card. Of course we see the fallacy, but we still fall for it. Who doesn’t want to pay away their problems and solve everything five minutes ago? The wisdom that stems from not falling victim to this ludicrous consumption-driven trap is nothing short of divine. When we accept life as it truly is–majorly imperfect and with incremental steps towards our deepest-held dreams–we’re destined for success. For example, when we see the light at the end of six-figures of debt, as so many of you have, or when we conceptualize the freedom of true financial independence, then can we actually make progress towards changing our lives. These short-term opiates of the masses fail to strike at the core of what fulfills us. When we shun their siren call, we open ourselves up to the possibility of reaping genuine happiness. I’m not a fan of the anything goes/devil may care/laissez-faire attitude. I prefer to think that as a reasonably competent person, I can exert a modicum of control over my life. My spending isn’t overblown because I regulate it. My money isn’t a mess because I manage it. My house is tidy because I actively declutter and clean it. 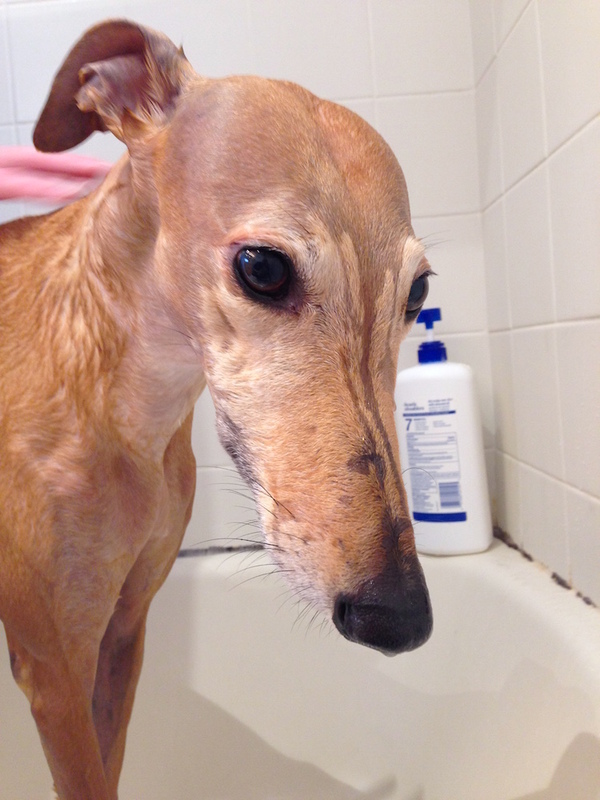 My Frugal Hound is nice-smelling because I washed her. I have significantly less to fret about because I know that I’ve taken care of what’s within my power. The rest is completely out of my hands. And I have to be at peace with that. I’m working to find my way to a place where I breathe through the uncertainties and ambiguities (not a strength of mine) and arrive at acceptance. With the impending arrival of Babywoods, my detailed lists and advance planning have allowed me to reach a point where I’m not worried about her birth or our nascent parenting days. Sure, there’s plenty I’ve probably forgotten or neglected, but I’ve tried my best. There’s nothing I can do about when I’ll go into labor, or what the birth will be like, or even Babywoods’ initial temperament as a, well, baby. But I’ve controlled what I can. And for me, that’s liberating. How do you control what you can in life and let go of the rest? I can relate to the desire to control sooo much! Nothing challenges that more than having kids, at least in my experience. So that’s great that you’re striving to let go of what is outside your control. I agree that trusting God is a huge help to me in this area. I’ve used the exercise of writing down what I’m mentally spinning about, then writing down doable action items, doing them, and releasing the rest. It helps! Writing things down helps me immensely, too. Your post has reminded me to do this more often. Yes! I’m all about writing my to-do’s down–it really does help me clarify my goals and my mind. And, I’m definitely anticipating having a great deal less control over life for the next, oh, 18 years ;). Yoga for the win! Love the way Babywoods’ nursery looks, and it sounds like you’ve got everything under control. As a chronically anxious person, I can’t even imagine the holding pattern that you must be in waiting for her arrival. But I do think the times when I surrender and accept are actually the times I’m most in control. Beautifully written post full of wisdom. Best wishes! I thought of something you can do, Mrs. FW! 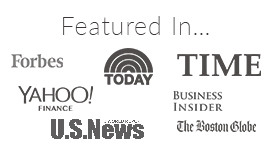 Take a look at your BabyWoods mobile. One of the things I discovered with all my babies was that no matter what mobile I bought – NONE came so the baby could see it. They’re all made for the parents, grandparents and friends to oooh and aaaaah over. What I did was eventually make my own but with the twins I turned those little things that moved so the babies could see them, not just the bottoms of elephants and tigers and lions. Think about it. If you were lying down and looked up at that mobile what would you see? FEET, or BOTTOMS of whatever. So, sit in that lovely rocker and you can test it out while you change that mobile so BabyWoods can really see those wonderful animals, or flowers, or shapes. Good point! The mobile we have (a hand-me-down, of course 🙂 ) has dangly, colorful stuffed animals and it hangs on a slant, so hopefully she’ll be able to see them OK on her back. Like you, I struggle with waiting and not having control. I am not always zen, but I am learning to do what you can and just let the rest go. It is both liberating and terrifying. I wish you a healthy delivery. I’ve frequently been told that you can’t control everything, but you know what you can control a lot more than you think. There is a huge difference between planning and hoping. We don’t worry about our home, finances and many other things because they are on cruise control. That frees up a lot of time and stress to concentrate on other aspects of life. I’m not much of a fan of hoping things work out. At least try your best and if it doesn’t work then so be it, but at least I tried and have no regrets. As a newcomer to your blog, I want to say how much I’m enjoying your delightful writing! As a mother of five (including twins) and grandmother of eight, I want to say you’re in for the biggest, and possibly most surprising and rewarding adventure of your lives. Blessings to you and Mr. FW, your adorable Hound your sweet baby. It’s very good that you are learning this lesson before your life is turned upside down ???? You will need to do this forever now. Children are amazing but totally unpredictable. No books can prepare you for that. You will need to do a bit of going with the flow. You can think you will get baby on a schedule and it won’t happen. Or baby might be on a schedule and then teething throws it out the window. My biggest piece of advice is to not set yourself into any kind of way of parenting. Trust yourself to know what your baby needs. Don’t let everyone else tell you what’s right. From having two I know that even two babies from the same parents being raised the same way, will be totally different. My oldest is almost 8 and still prefers me to help her pick out clothes and get dressed. My 6 yo has been doing this herself since she was 18 mos!! You will find a groove that will mostly work but it has to be a groove that the three of you create, not what society or books or other people tell you. Congratulations on being so close! I’m excited to see what kind of parents you become! I know waiting can be so hard! I did it twice with both my babies! I’m curious what you’ll do about childcare when you return to work. How wil you keep that budget-friendly? 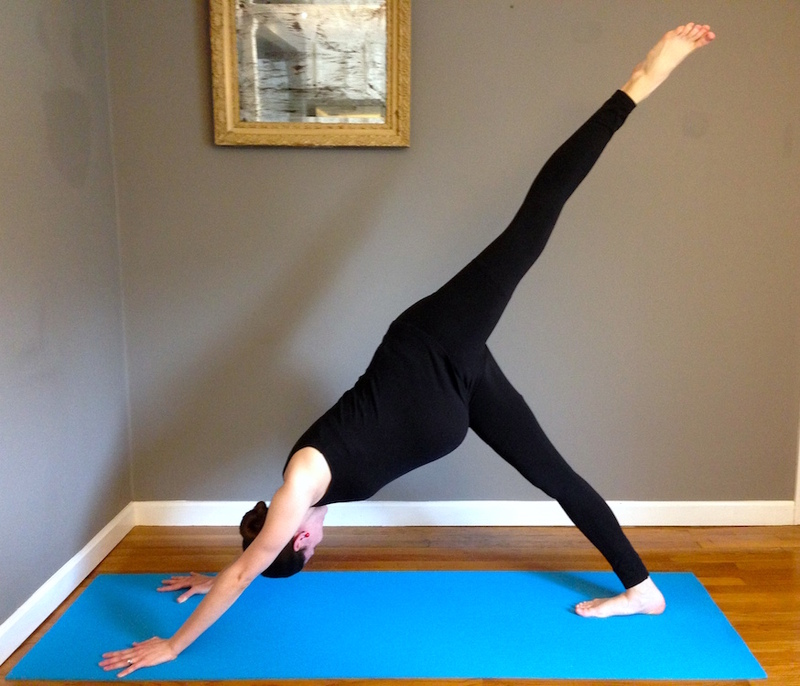 What do you think the baby thinks when you do downward dog? 🙂 Looking at that picture made me wonder if they slide around during yoga poses. 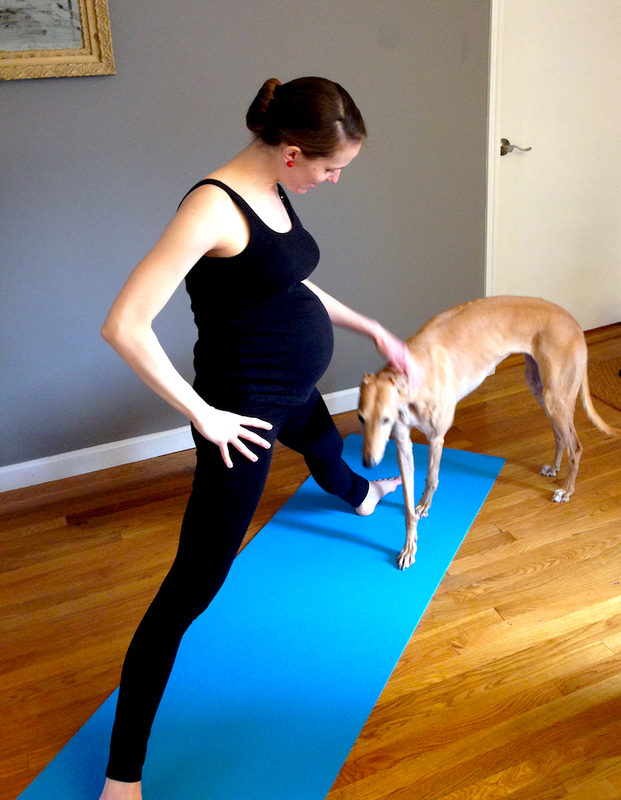 Yoga will certainly help with labor. All will be well and you two will be great parents. Hahah, that made me laugh out loud! I think baby does kinda slide around a bit during yoga–I notice that she gets very active right after yoga, it must wake her up :). Doing yoga throughout pregnancy has been wonderful and has helped me feel good the entire time. Very grateful for my yoga practice! Congrats on being so close and so well prepared! Once you get to the hospital, they probably won’t let you eat (just in case you need anesthesia for an emergency c-section) so Mr. Frugalwoods will be enjoying those scrumptious snacks in your bag. If getting to the hospital lickety-split isn’t necessary, taking the time to have one last good meal at home may make the next few (or many) hours until delivery more comfortable. Yes indeed! The snacks are totally for him :). Can’t have my main man/birth coach being hungry during labor! This post put me in the mindset of a twelve step support group, especially reminding me of the Serenity Prayer – grant me the serenity to accept the things I cannot change, the courage to change the things I can, and the wisdom to know the difference. Peace in life can be found in changing what you can, and accepting that there are things outside of your control. Looks like you figured this out already! Do what you can do and leave the rest to God. Yes! Yes! Yes! Out with the books, in with logic and with (some smart) suggestions from the ones who have been there before. I remember planning everything before my 1st, and man did everything NOT turn out like I expecte… So for the 2nd, I relaxed and it went so much better!! 2 kids, 2 years apart, yet totally different approach. We live and we learn. What! You haven’t registered her at Harvard yet? Oh you disorganized, lazy set of parents! Sorry, just trying to be funny! I’m actually not that good at it. This was a very enjoyable post, and behind the words, planning, and enormous efficiencies of your world, you actually “sound” very happy and excited about the birth of Babywoods. You will be fine….I’ve never seen more preparedness in my entire life….and I’m not a spring chicken. The Boy Scouts can take direction from you. Your nursery is also beautiful. 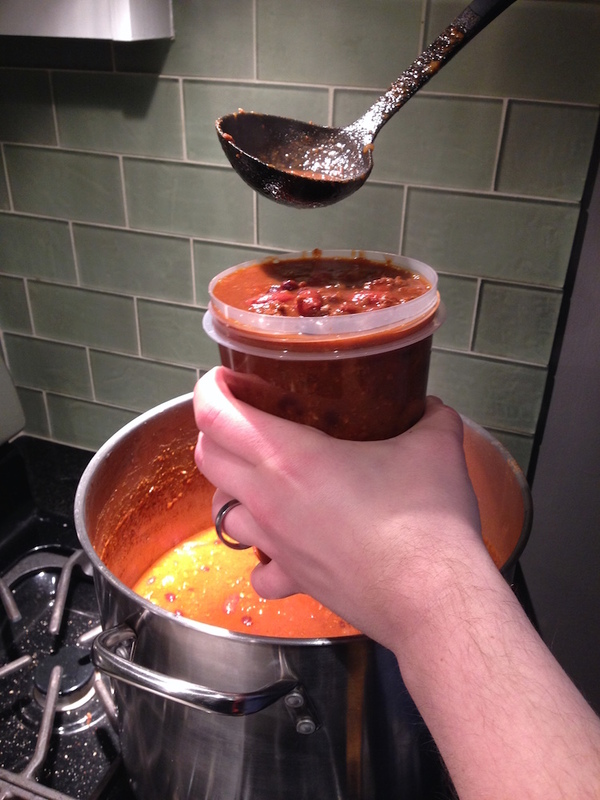 And kudos to Mr. FW; his cooking skills and efficiencies are nothing to sneeze at either! I can, however, find a lot better ways to relax than that upside-down thing. Now, go get that car vacuumed! We’re all waiting “patiently” for your new arrival! Ah, waiting. Little Cheapheart was two weeks late. I waited tables until 40 weeks, my customers looked at me like I was nuts, the pity tips were good though. I taught school until 41 1/2 weeks and my students were beside themselves wondering if I was going to give birth during class. Unlike you, I am a total type B, but it was tough for me too. Then I put the final stitch in the blanket I had been knitting for him and laid what I had been working on for eight months out on my bed to admire. I went into labor the next morning. My suggestion to make the best of the wait is to enjoy your last bits of time as an unencumbered, autonomous being. Enjoy some alone time with Mr. FW, invite some friends over, walk down the street without worrying about anyone’s physical needs but your own. Best wishes for a smooth birth. Your yoga practice will serve you well. Your description of yourself is so similar to my experience. It was impossible to be more prepared than we were! Parenting is an excellent way to flex your patience muscles. You will wait…a lot, and I bet you will learn to enjoy it and fully engage with your girl. Whether you wait for her to finish feeding/eating/trying to fall asleep/waiting for her to get to sleep in the early days. 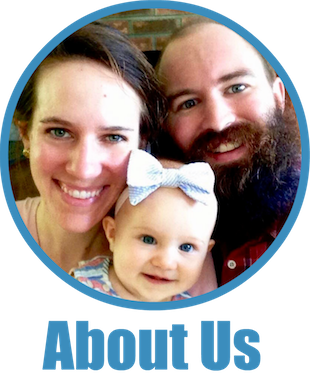 Initially I was very frustrated by the “slowing” of parenthood. I was used to zipping around at warp speed, accomplishing every task. However I have learned to just “be” and enjoy Every moment with him. Even now, at 9, I go up with him at night and get him to bed. We talk, read, cuddle. Often I’m thinking of what needs to be done once he’s asleep..,but more times than not I’ll just realize that time goes so quickly and right now this little boy wants nothing more than for me to be there with him, fully present. You and Mr FW will be fully present parents- what a blessing for your girl! Thank you for this advice! I’m glad to hear that a fellow Type A has mastered the art of slowing down! It’s definitely a struggle for me, but I know that Babywoods will be the ultimate teacher of patience–I just need to learn to listen :). You sound like a true kindred spirit! It’s a running joke that little Mrs. Lewis loses it when she can’t organize, or plan every detail of her life. All of which is only minutely true. I do, plan and strategize to a level of obsessive BUT if things go off course I usually manage any major changes. Especially if I planned for them. I am so excited for your family. You are about to fall in love again! Expanding upon knitting – you can’t feel completely lazy or unproductive when your hands are creating. And then there’s the whole creating aspect. Knit when you’re watching video, riding, holding baby and especially when you’re WAITING for something. So very true! I’ve knitted in the past, but haven’t picked up my needles in awhile. You’ve reminded me of the joy that comes from occupied hands! I’ll have to go dig out my yarn tonight! I do what’s within my power, and consciously give the rest to God to look after. I’m much more of a control freak now. But back when I became pregnant unexpectedly in my early 20’s, I wasn’t prepared at all. I think I skimmed thru one parenting book, and we skipped half the pregnancy classes. The nursery wasn’t even ready, my mother in law completed that when I was in the hospital. Even the delivery wasn’t what I expected, it was incredibly quick. But despite all that, some kind of maternal common sense took over after my daughter’s birth and those early years were some of the best in my life. It will all happen naturally. As it should. I hope we get to see baby pics! With #2 I wasn’t going to let that happen, so I took off 2 weeks before and…he came on his due date. The day before his due date, I found myself walking 1.5 hours in deep sand (to shake him loose), followed by an acupuncture session (I was going for sleep reasons), during which she gave me a little “extra” to help bring on labor. With #1 I got the desired epidural. With #2, well, he came too fast, my spouse wasn’t there for half of it (he was dropping our older son off at a friend’s house), and let’s just say I was NOT prepared for that. He came so fast that I wasn’t even in the computer by the time I could order breakfast. Oh wow–I’m impressed you worked another 2.5 hours after your water broke! That’s some dedication right there :). The waiting is tough, but I’m finding that staying busy helps and just trying to enjoy this calm period before the proverbial storm ;). Hang in there! Today is my due date. Everything is looking good, and he is apparently perfectly happy in there. They won’t induce till 42 weeks, so I am just enjoying this little space. Nobody expects anything of me right now! I am astonishing people by doing things like getting up from sitting by myself. I have never felt so accomplished for doing so little. I am thinking of fun things to do every day I go overdue. Try and come up with something fun for each day till she comes, not just chores. Though I do understand the urgent need to do chores, I have been seriously enjoying scrubbing floora lately. Haha, you are cracking me up: “I am astonishing people by doing things like getting up from sitting by myself.” So true! It’s funny how infirm people think we are. I hate to break the spell and tell them that I honestly feel fine (if a bit awkward and sleepy). Ooooo floor scrubbing–you’re speaking my language. I’m definitely trying to take it easy and relax, but it’s much more natural for me to pop around doing things–I have been successful in reading some novels though, which I count as a plus. I hope you’re doing well and maybe you even have a new baby by now :)!!!! You’ll have to update me! You are so smart to have everything in order before baby is born. It’s amazing how needy a tiny little person is (not to mention the laundry they create). Take care of yourself and enjoy every minute. It’s really true, they grow up so fast. I think the most important thing is to trust oneself as an adaptable, resourceful person. Can you control the outside world or other people? Of course not. But you have to trust that whatever happens, you will handle it. I’m with you on the surreal-ness of the “real adult” position in life–I still haven’t fully accepted that I am one. But, you’re very wise to have that trust in yourself. I like that approach! Rejecting the culture of immediacy is so important, I agree! Also, you look so happy and healthy and I love that you’ve been able to continue practicing yoga during your pregnancy! I am terrible at waiting as well! But, as you say, setting ourselves up toward true happiness and doing what we can that is in our power is all we can do. Acceptance is a wonderful thing. Thanks for the inspirational words! And congrats and good luck on the excitement ahead! So excited for you !!!!! My first baby was a week early, and I was thankful. One thing I am wondering about is what will happen for babywoods as far as daycare goes? Assuming you will both still be working after parental leave? Would love to hear your thoughts and plans as it is one of the most expensive things as far as babies go. I am a single parent (by choice) and decided to use my workplace daycare (current cost is over 2k a month for an infant)- but even though I work at a MAJOR Boston hospital, they only had 6 baby slots, so getting a space was hard. I literally went to register the day after I had a positive pregnancy test and even then, only got notification of a spot when baby was a month old! Looking forward to hearing exciting babyhoods news! Thank you, Monica! We haven’t discussed our childcare plans yet on the blog, but fear not, we will in the coming months. So stay tuned :). Glad to hear you got a coveted daycare spot–it’s definitely a challenge around here! I am just dying of excitement for you two. Like so many readers of this blog I consider you guys my bestest frugal friends I just haven’t met in person yet. I know it wasn’t easy for you guys to get pregnant and you take nothing for granted. As someone who is working hard to get pregnant myself (who knew this can be so hard!? ), I can’t wait to read your posts from the other side. (When you’re ready, of course!). Lots of love from the west coast! Many thanks, Diana! 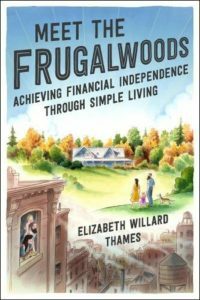 I love the connections we’ve made with our fellow frugal cohort around the world–so awesome to have you guys all here to talk about frugal stuff with :). I wish you all the very best on the trying-to-conceive journey. Who knew it could be so hard, indeed?!? Hang in there and I hope you get a positive soon!!! Congratulations on the soon-to-be Baby Frugalwoods! What an exciting time. I think your post also gets to the “greener pastures” syndrome so many in our generation have. We think we need to have the perfect job, the perfect apartment, the perfect car, etc. Especially when it comes to careers, I think a lot of people give up good jobs because they don’t feel it’s their “passion.” Perfect becomes the enemy of great. You’ll do great! You have all the bases covered. We are raising our grandchildren since the end of March as their Mother passed away unexpectedly. A 3 mo. old girl , a 3 1/2 year old boy and a 7 year old boy. We try to find everything used as our youngest is 27 and we had long ago passed all of the baby items on to other people. Your frugal, new to you nursery items are beautiful! How giving and wonderful you are! Your grandkids are lucky to have you. Good luck! I agree with Leah–your grandkids are very fortunate to have you! Wow only weeks away, that went fast. You guys look incredible prepared. There will be curve balls along the way, there always are and no amount of planning can prepare you for that. I don’t let things outside of my control bother me, why should I waste energy on things I can’t change or control. No matter how much I think or plan for them I can’t change them so I spend time on things I can. Oh what a good post for me to read today. I am a planner, an organizer, a person in control. My first was born a little over two years ago. He arrived 8 weeks early while we were out of town (one last little trip before his birth). We wound up four hours from home for the next three weeks, then a week in the NICU after he was flown back to our hometown. His first year was pure survival mode. We had ideas for routines and schedules and building good habits and he would have none of it. I think at some point we finally just said “we give up!” At 20 months, he fell into a routine and now sleeps and eats and plays with ease. You’d have thought we learned our lesson that you can’t control much and that you have to do what you can and let other things sort themselves out, but it’s still something I struggle with now that I’m 28 weeks along with our second. I worry that she will come early, despite that we are doing everything possible to prevent it. I worry that she also won’t sleep, even though I know she either will or won’t on her own accord so it isn’t worth my worry. So, I will pack my hospital bag early just in case she arrives early. I’ve set up the nursery with a crib and also a bed in case she winds up needing me to sleep with her for the first year like her brother. I will remind myself that holding tightly to the reins only will make the horse angry, but gentle guidance will send us all along a nice path. Oh wow–8 weeks early is quite a curveball indeed! Congrats to you for handling it so well and for figuring out how to make it all work. I hope that your pregnancy is going smoothly and that she decides to stay in there a little longer than her brother :). I wish you all the very best! I have to say, though, I get accused of being a control “freak,” and I identify as one, but WOW, in comparison to your planning and ball-juggling skills, I’m likely one of the most laid-back and ill-prepped human beings ever to surf a web, LOL. Just reading everything you’ve accomplished since your parenthood became pending makes me tired. Haha, yeah, I’ve been accused of “over-planning” before… ;). It’s an ongoing struggle for me to try and let go of things! LOL. I remember the days of nesting before the birth of my daughter it seems like only yesterday now 6+ years. I too wanted to clean out the car, wash it, and clean my house from top to bottom. I did manage to do most of it before she was born but, some of it I let go and decided it wasnt worth it besides who actually sees those top shelves? Good luck with baby FW and love the nursery. I had to overcome a fairly passive approach to life – which, perhaps as the youngest of five, I considered to be something that happened to me rather than something I had the power to influence. It sounds like you have the opposite challenge. Babywoods will help you move towards that sweet spot of serenity where you recognize what is yours to control and what is yours to respond to. And by the way, you look fabulous with that baby belly! Almost there! My first was 10 days late and it felt like FOREVER. Whenever Babywoods arrives it will be perfect for your family… And so fun to have a baby during the holidays! The picture of your rocking chair takes me back to some of my most treasured memories of my own babies. I rocked and rocked and cried and laughed and rocked some more. We read books and sang songs while our hound sat at my feet. You will have some amazing moments in that rocking chair. Blessings to your family. Congrats on everything. Seeing your pregnant belly is so awww. It’s funny how much of a difference a few months can make. I could hardly believe you were pregnant at FinCon. Lists are a great way to manage stuff and realize when your expectations are out of control. It becomes so obvious as the list grows and grows but don’t feel bad about lists they are going to be super helpful those first months specially if you suffer from baby memory loss…. Which is not really memory loss but seem pretty common as you run around with a lack of sleep. Id forget so much stuff… Lists were a savior. Also your nursery does look lovely! Old school rocking chairs for the win!!! Baby is due any time now right?! Good luck on the labor. Seems like you have pretty good insurance, unlike our high-deductible plan, so you might be set. We have a $6k deductible individual ($12k family), so I had that much earmarked. Thankfully, our hospital is pretty affordable, so the baby + me was $6.5k total. Not too bad. Just a shock and frustration because I didn’t meet my individual deductible like I thought I would. Looks like you’ve done all you can do. The baby will come in her own time. It is easy to be anxious while waiting. I think first time moms usually go over — I went over by 5 days. Have something nice planned for your due date so you’re not disappointed that baby didn’t appear (just in case). I went to a food truck festival! I also spent lots of time walking, which perhaps finally worked, as my labor started in the middle of a 3 mile jaunt around town. Last tip: it is nice to bring some sort of treat for the nurses. Some people bring takeout giftcards, bags of chocolate, etc. I don’t think the specific treat matters — just something nice. My mom brought in fresh fruit for them. Ugh, health insurance–always such a pain to navigate. I like the idea of planning something fun for the due date :). Since we’ll be right at Thanksgiving time, I’m thinking perhaps some homemade pumpkin treats and watching the Macy’s Day Parade… and then taking a walk is a good idea too! There is definitely a fine line between trying to prepare and making yourself go crazy with worry and last minute preparations. There’s a lot of similarities between saving for your financial future and trying to get ready for a baby. I wish you guys the best of luck. Parenthood is the most rewarding and challenging thing you will ever face. One of the greatest blessings and curses that kids give to you is the understanding that you can’t be in control all the time. It’s tough for someone like me to accept this, but I realize that it’s a lesson I have needed to learn. I wish I could make choices for my son all day long, but I have to accept that I am mostly a active witness to his life journey and I just have to be there for him in a support function whenever he needs it. Oh I love that: “an active witness to his life journey”–what a perfect and beautiful way to describe parenthood! Oh yes, I feel like I’m in for that huge shift in my time not being my own! It’ll definitely be a whole new adventure for me :). But I’m glad to hear that you’ve found a way to make it wonderful and make it work! It’s so important to know when to let go but hard to know where that point is. Both of our teens have food sensitivities. They aren’t life or death by any means but if they want t live well, they need to abide by them. Not easy for teenagers. We’ve decided we can control what we purchase and bring into our home and have to let go of what they might consume when not in our presence. I’m excited to hear when your bundle of joy arrives! You’ve set up a beautiful nursery! You’re so right! I promise I’m trying to take your advice :). It’s just so hard for me!!! I am excite about babywoods. We can have control in life if we plan that we can. If not, so many issues would just occur. So, we’d better be in control of what is happening and what we’ll have in the future. Such a special time in life… All the best! Thank you so much, Kim :)!